Everyone has one. Well, I assume everyone has one. A junk drawer. Where the miscellaneous and random items in one’s home ends up. 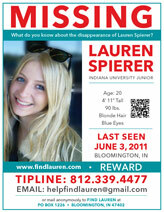 Ours has always been a hot mess, like an episode of hoarders hot mess– minus the dead cats and decades-old newspapers. So I decided to tackle it this weekend. Here’s what I started with. Yikes. We had everything in that drawer. Batteries, gum, ping pong balls, a hammer, scissors, pens, nails, loose change, tape, picture hanging wire, matches, tissues, flashlights, hand warmers, light bulbs, cough drops, a whistle, super glue, glow sticks, etc. You know, normal everyday items. This was my strategy: take everything out of the drawer, throw away any unnecessary items, relocate any items that didn’t belong in the drunk drawer (cough drops, medication, excessive tape, etc. ), and put the rest of the stuff back in the drawer. A couple months ago I purchased a bamboo flatware organizer. I tried it with our flatware for a while but I wasn’t a fan, so I put it to use in the junk drawer. It worked out great. I grouped like items together and fit them into the organizer accordingly. It was like playing Tetris, but with matchboxes and chip clips. I used the open space on the lower right for larger items like the hammer, pliers, screwdriver, scissors, tape, and a small container for loose change. I also used a little plastic bin for light bulbs and cabinet bumpers. Don’t ask why we have so many Sharpies, pens, and pencils. I will add that I tested each marker before allowing entry back into the drawer. Well there you have it, our less-of-a-hot-mess junk drawer. Let’s hope it stays nice and organized for a while. 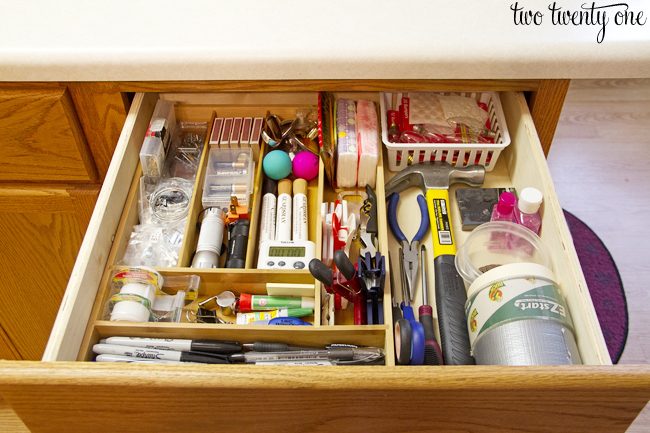 Do you have a junk drawer in your home? What’s the most random item I would find in your junk drawer? 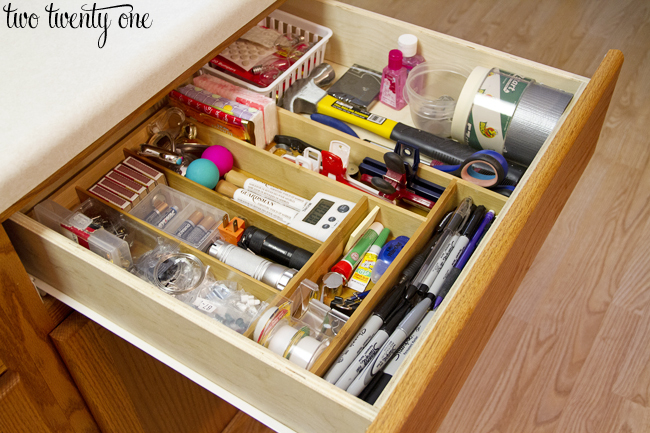 I commend you on not having a junk drawer. I’m pretty sure it’s in my genes to have a junk drawer. Don’t you love marital compromise? Brad’s junk drawer is the garage. I’m impressed that you only have one junk drawer. I’m pretty sure we have 3-4 and they could all use some organization! Hah! Well we do have a couple cabinets that are questionable. Ashley, we have three junk drawers in the kitchen too! One is mainly tools (hammer, screwdrivers, extension cords, nails,e tc), one is pens, pencils, tape, scissors, etc. , and the third is batteries, rubber bands, pop tops (collected for school) etc. Oh, it’s definitely elves. They hit my closet daily. After we accepted an offer on our house a few months ago, I was cleaning out the junk drawer and found a ziploc bag containing a ponytail with about 8 inches of my own hair. It seems I forgot to send the bag to Locks of Love. Oops! Hah! That’s the best one I’ve heard. Yes, I have a junk drawer. I’m proud to say it was just cleaned and organized because of our kitchen renovation, otherwise, it’s a hot mess, top. The Weirdest thing in it is probably the bag of miscellaneous kitchen parts and screws that I forgot to label so I have no idea what they go to. Fail! I found a bunch of random parts too! I ended up throwing them away figuring if I couldn’t remember what they went with I probably didn’t them anymore. Let’s hope that logic doesn’t come back to bite me. I have a drawer specifically for odd cords and hardware…seriously… who does that? 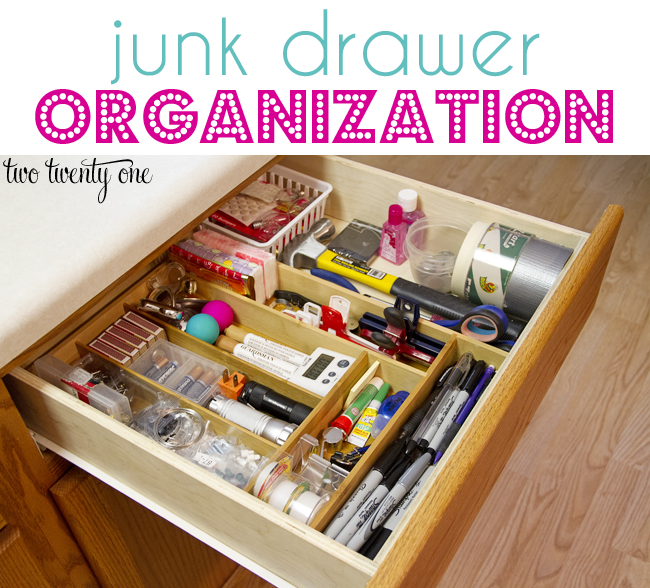 Is that a “junk” drawer or organized. HMMM??? I’d love to know where you got the bamboo organizer. Thanks! Hi, Ginger! I picked it up at Home Goods. Yes where did you find the bamboo organizer? I have a couple of junk drawers along with some unorganized drawers. Great job organizing and nice to hear you didn’t like the organizers for utensils. Wondering if built in ones would be better? I will have to try! In our entire kitchen we only have one drawer which is for cutlery. 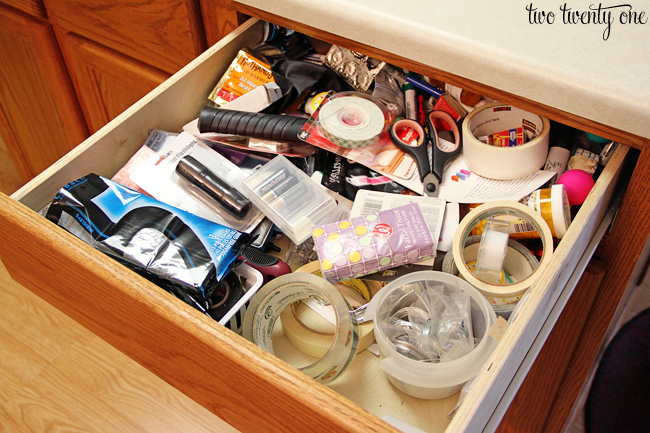 I really, really miss having a junk drawer! Only one drawer?! You’re a champ. I don’t think I’d be able to function with only one. I had that problem in a previous kitchen in a small apt. The small drawers in the kitchen (3) wouldn’t even hold a small silverware organizer! I took a chest from my childhood bedroom, painted it teal, put it in the adjoining dining area and had lots of drawer space! Used the tiny drawers in kitchen for cooking utensils (no counter space for a crock), and dish towels. We TOTALLY have one. You can barely open it though, so I don’t worry about organizing it. I just sliiiiide things in through the tiny opening. Interesting strategy. I like it. I have recently moved into my boyfriends house and he has 4 junk drawers. I already told him I was going to be tackling his disaster and getting it down to 1. I love this idea especially since I already have one of those organizers that I was just going to put in storage. 🙂 This post just made my day. We just moved and our new place has TWO drawers in the kitchen. TWO. That’s it. So freaking lame. And all THREE cupboards are full of kitchen stuff, so it really stinks. Currently, I just have all of the “junk” that was in our previous junk drawer in a pile. The pile is begging me to do something with it, but I don’t know where to put it all!! UGH! I do have a junk drawer! I think it’s important to have a place to put all those little things that wind up on the counter. I also just re-did mine with some cool contact paper that I picked up at the dollar store. I used what I had on hand, as far as containers, so it’s not as neat as I would like. I’m eyeing some clear containers so you could catch a glimpse of the paper underneath. Nice job on yours!! Ah, the junk drawer…my problem is not so much that I can’t organize it, it’s that I can’t seem to maintain the organization for very long. Well, maybe I would be able to, but somehow among the six of us here, it gets messy all too soon. This is great! 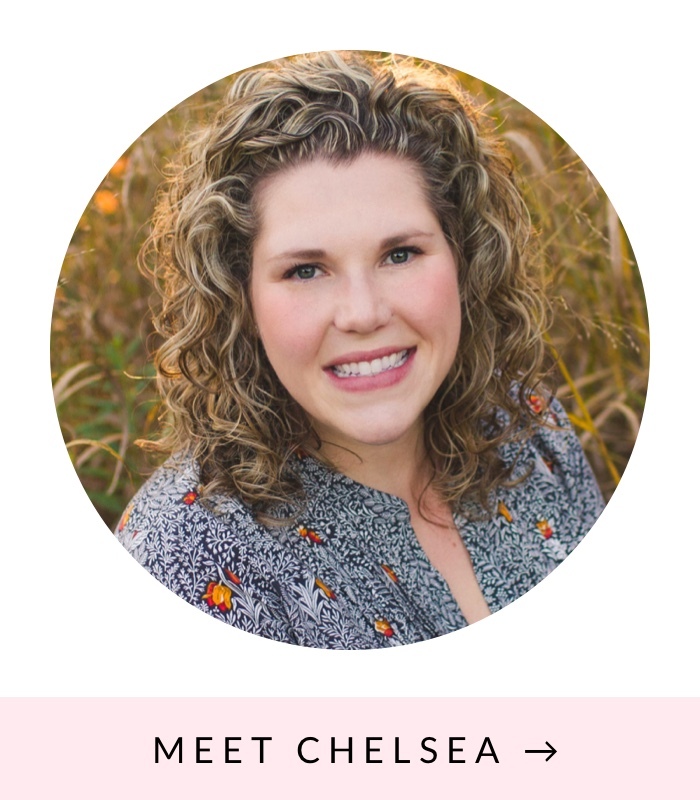 I’d love to have you share your October organizing tips at my monthly Home Organization Ideas Link Party – it just opened! Ok, only one question. Who has a junk drawer that wide? The wide drawers in every kithchen I’ve ever had are few and far between, and the one or two that exist get used for silverware and serving/baking utensils. 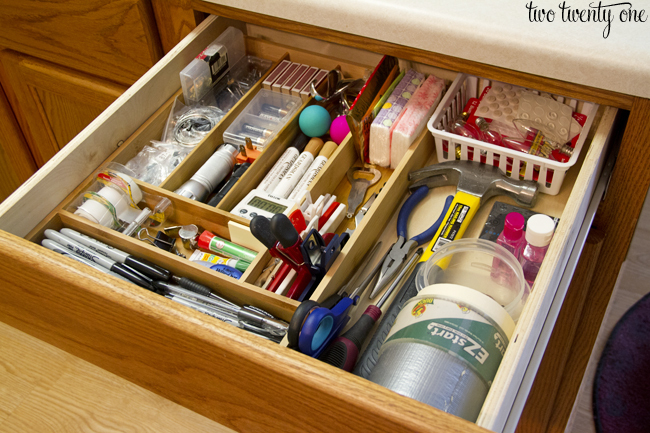 The ‘junk drawer’ is the one that’s less than 5 inches wide, and won’t hold a standard flatware organizer. I have a junk drawer that wide. I have four 22 inch, two 14 inch, one 10 inch pull out drawers and two 17 inch tip-out drawers in my kitchen. The drawer I use for my junk drawer is one of the 22 inch drawers. – ALWAYS declutter items before you organise them. Especially before you go out and buy any storage containers to keep said ‘stuff’ in! – Storage containers can often end up as ‘clutter’ themselves (I DO love storage containers/organisers though, so hear me out). One common thing that happens is that we tend to buy them ‘in the moment’, rather than after decluttering, figuring out exactly WHAT we need to put in them and most importantly – what SIZE the containers need to be to fit in the drawer/shelf/etc. (not to mention the right size for the stuff that’s going in them). – So, as someone who is still in the process of organising and decluttering my stuff, as well as renting (meaning I move every couple of years, so my storage ‘situations’ change frequently), I came up with the whole ‘upcycle cardboard boxes’ thing a couple of years ago (somewhat amazingly on my own, without the use of pinterest or anything haha). Basically, I was SO SICK of having little storage containers/boxes that either didn’t fit or left a whole lot of ‘dead space’ in the drawer. So I started collecting cardboard boxes in various sizes from things like cereal, muesli bars, tea bags, etc. and eventually had a fun afternoon with my desk drawer ‘playing tetris’ and cutting and sticking boxes together in a way the fit both my drawer AND my stuff (generally when cutting the tops off boxes I tried to make them all the same height). 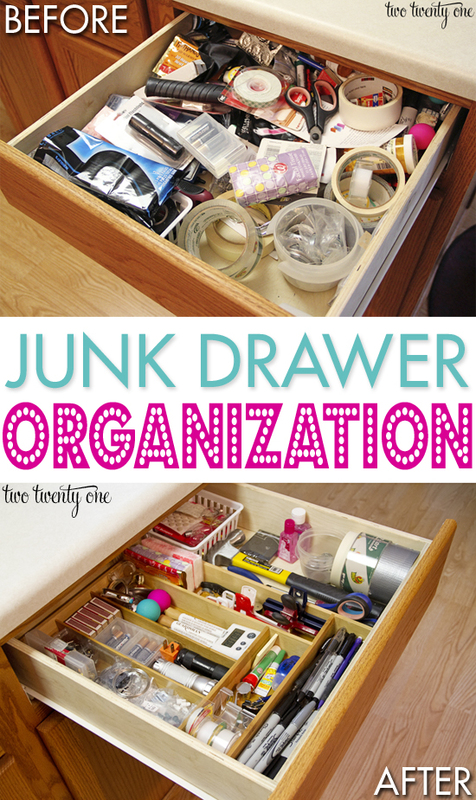 I ended up doing the same for my junk drawer – and IT WORKS! Stuff actually STAYS organised! I have a horrific junk drawer in my kitchen. This motivates me to tackle it. I wanted to mention though, according to my fireman friend, many house fires are started by the junk drawer. We shove things in there and when those things are 9 volt batteries and flammable materials (such as steel wool) it can be very dangerous. Please find a different safe place for those items. I had no idea about it until he mentioned it, so be organized and safe everyone. I agree! That’s why I use a container specifically designed for batteries. You can see it in the photos. It’s nice because it keeps the batteries organized and safe. I noticed that and like how easy it is to see what you have without them bumping and rolling around. Kudos on this whole blog post. It makes it seem an attainable solution for anyone, not just for model houses. I clean and save the trays from store bought cookies to use as organizers in my kitchen drawers. Great idea! Hadn’t thought of that, in fact just tossed some into recycling bin. Those would be great for batteries.! I use the plastic trays that frozen dinners come in for drawer organizers: great for junk drawers, make-up, hair accessories, etc. You can usually fit at least 2 of these in a drawer, sometimes more, depending on size of drawer. lol very smart to check the markers worked now that i would not have even thought of!